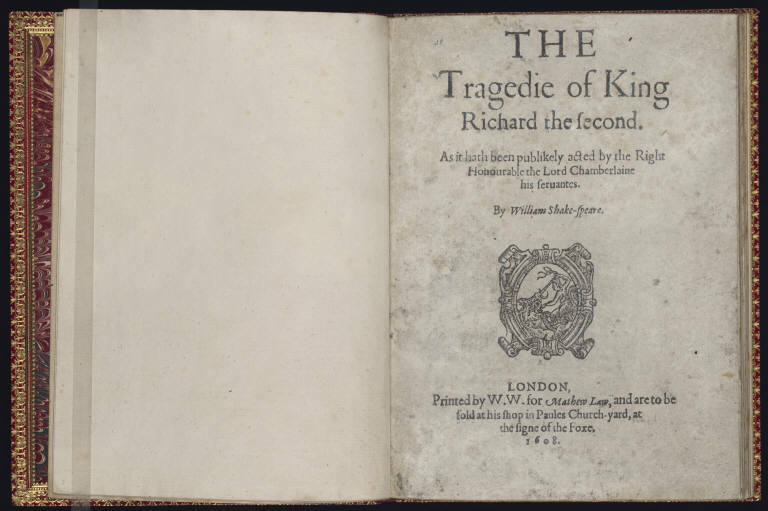 Richard II was first published, in quarto format, in 1597. 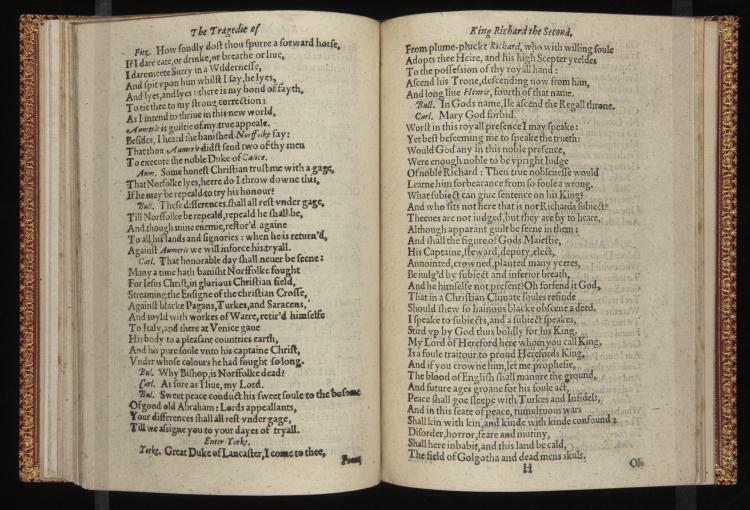 Between then and the release of the first folio in 1623, several more quarto editions of the history play were released, each diverging by varying degrees from the 1597 quarto. Most likely for reasons to do with censors, a pivotal episode in the double history of Richard’s fall and Bolingbroke’s rise was excised from most quarto editions: the deposition of Richard by Henry IV (4.1.155-318), when the king who believed that “not all the balm in the rough rude sea / Can wash the balm from an anointed king,” is brought forth unto the stage so that “in common view / He may surrender.” It was understandable that such a scene should give censors pause; the play, after all, provoked a famous over-identification in Queen Elizabeth—“I am Richard II, know ye not that?”—as well as a failed rebellion by the hot-headed Earl of Essex. 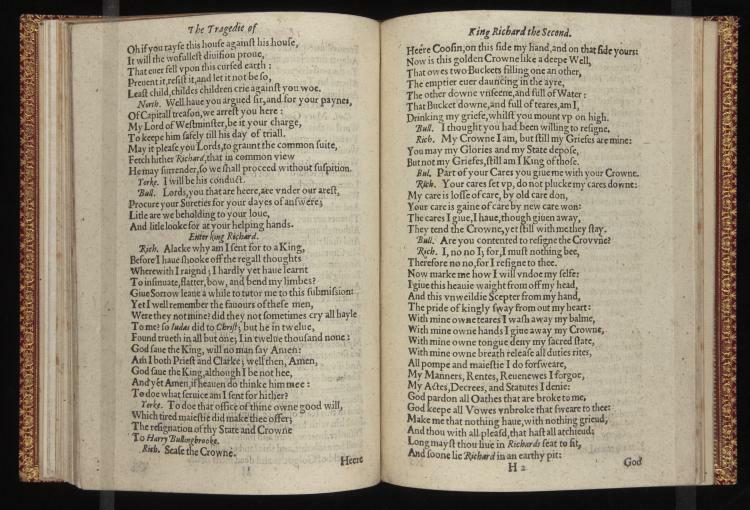 It would not be until the first folio, in 1623, that a polished version of the deposition scene would be published, but a first version of the episode—possibly reconstructed from memory, possibly transcribed, hastily, from Shakespeare’s original version—made its way to the bookshops of Paule’s Churchyard, in the form of the 1608 fourth quarto, pictured above. This earlier printed version of the scene is generally less polished than what would be presented in the Folio, shorter and marked by occasional misspellings, mislineations and absent lines that are supplied by the 1623 Folio edition. Rougher as it is, though, the quarto’s version of the scene was an addition worth advertising. A variant title page, also supplied by Matthew Law, the printer of the copy displayed here, boasts of the decisive amplification of the play; in the space of just a few years, it was a scene that had become both new enough and, it would seem, safe enough politically under the new reign of James I to attract potential buyers. 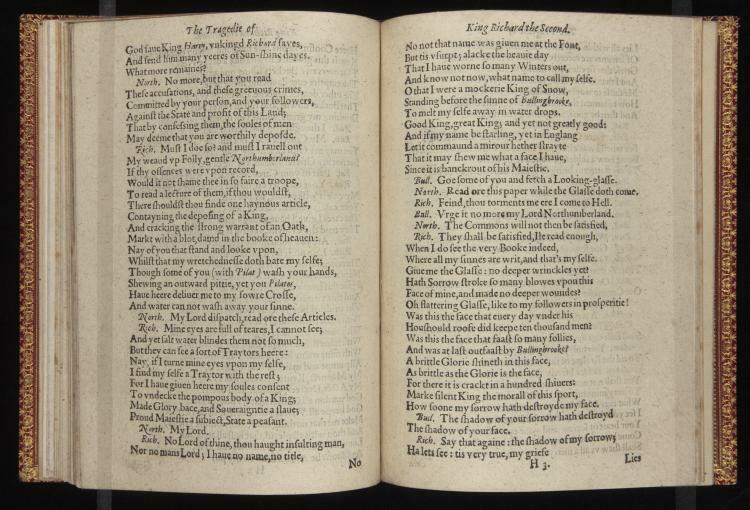 Follow this link for a scanned copy of Richard II (1608), from the collections of Yale University’s Elizabethan Club.